Help the Wyrd Sisters set up a ward to protect Deleyn's Mill. The forest itself seems to have turned against the village of Deleyn's Mill and the villagers are in danger. I should see if I can help. Talk to Babineaux Redain and/or Bernard Redain. Collect the Essence of Aetherius for the Wyrd Ward. Meet Helene inside the mill. To start the quest go through the Daggerfall gates directly east from the Mages Guild and follow the path until you come across a man named Bernard Redain speak to him. He'll tell you about a Deleyn's Mill and how monsters have overrun the mill. Agree to help him then cross the stone bridge and head southeast till you come to the mill. At the mill continue east and talk to Wyress Helene who is on a small island surrounded by water. She gives you a Torchbug and tells you to let it guide you to the essence of Atherius. Activate the torchbug and follow it to three different spots. Now go back and talk to Helene then follow her. Talk to her again in the mill for your reward. Babineaux Redain may not appear following the end of Bloodthorn Assassins. ZOS reports this is working as designed. 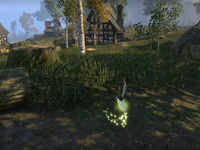 Head to Deleyn's Mill and speak with Bernard Redain directly. Bernard Redain and his family escaped from Deleyn's Mill. He suggested I speak to the Wyrd Sisters and see what I can do to help. Wyress Helene asked me to collect essences of Aetherius using a torchbug she gave me. She wants to craft a spell using the essences that will protect the villagers. Using the torchbug should lead me in the right direction. I collected what Wyress Helene needs to protect the villagers. I should tell her immediately. The ritual worked and the mill is safe. I should speak to Wyress Helene inside the mill and see what else needs to be done. This page was last modified on 6 December 2017, at 22:49.